In these spellbinding stories, Yiyun Li, a Hemingway Foundation/PEN Award winner, a MacArthur Fellow, and one of The New Yorker’s top 20 fiction writers under 40, gives us exquisite stories in which politics and folklore magnificently illuminate the human condition. A professor introduces her middle-aged son to a favorite student, unaware of the student’s true affections. A lifelong bachelor finds kinship with a man wrongly accused of an indiscretion. Six women establish a private investigating agency to battle extramarital affairs in Beijing. 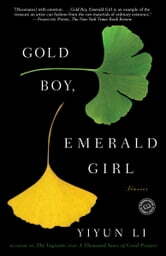 Written in lyrical prose and with stunning honesty, *Gold Boy, Emerald Girl *introduces us to worlds strange and familiar, creating a mesmerizing and vibrant landscape of life.